Amazon Prime is now available for Indian users. 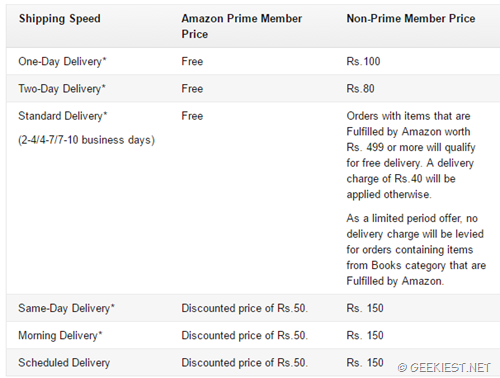 Prime is a service like Flipkart First. You will have pay an annual fee to get this feature where you will be receiving additional features like discounted same day delivery, Guaranteed One-Day and Two-Day delivery etc. for Free (these services are paid ones otherwise). Now you can get a 60 day free Trial of the Amazon Prime services for FREE. After that you will be charged INR 499 for an Year. Remember if you do not join the trial and want to join the prime later the annual subscription fee will be RS.999. So what are the benefits of Amazon Prime service? You need to check the prime logo on the item satisfy the conditions. After 60 days, you can choose to sign-up for Prime at a special introductory price of ₹ 499 a year. I suggest you to register for the trial version and cancel it if you do not like it, and if you think it is good you will be able to get the service for a discounted price of Rs 499.